The Rode Stereo VideoMic delivers true stereo X/Y recording in a compact, camera mountable microphone. The Stereo VideoMic accurately captures stereo ambiance while exhibiting excellent off-axis rejection and signal-to-noise ratio. The small, light weight profile allows quick and unobtrusive mounting on DV, HDV and SLR cameras without appearing in the frame. The Rode Stereo VideoMic features true X/Y stereo pick up for accurate ambiance reproduction. Excellent off-axis rejection minimizes residual noise. 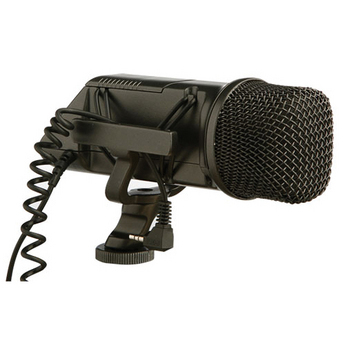 The Stereo VideoMic features a -10dB Pad switch for enhanced headroom and minimal distortion. 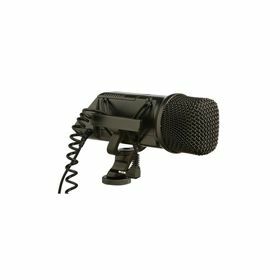 The versatile shoe mount allows the microphone to be mounted to camcorders, stands or boom poles. The Stereo VideoMic features a permanently attached shock mount with a camera mounting shoe underneath. The shock mount features replaceable rubber o-rings that protect against noise caused by abrupt movement and shock. A high-pass filter switch eliminates room ambiance and noise below 80Hz. This results in improved intelligibility while recording around machinery, wind or close proximity.